Emma is enchanted by the bustle of the theater and by its more aristocratic attendees. She enjoys the music and the sentimental story, which is just like the novels she read as a girl. She admires Lagardy, a flashy, handsome “charlatan” and heartbreaker. In his stormy seduction of the heroine, he reminds her of Rodolphe. Charles is bored and confused by the story, and doesn’t understand why the man is mistreating the lady. Flaubert is describing cultural literacy as a tolerance for implausible, highly emotional, and often unkind stories. Emma’s tolerance for such stories is very high, and Charles’s is very low. The well-being of others is more important to him than emotional excitement, so he can’t understand the purpose of sentimental cruelty or what might be described as "romantic excitement." Charles goes to get Emma some water and runs into Léon, recently returned from Paris. When Emma sees Léon, she is overcome with emotion. The three of them leave at the beginning of the third act, since Emma is eager to speak to Léon in a more intimate setting. Léon mentions that Lagardy is performing again in the next few days, and Charles encourages Emma to stay in Rouen and see the performance through to the end. Charles has a basic faith in other people’s honesty and good intentions – a faith borne of his own unfailing honesty and good intentions. That means he is easily manipulated, and easily taken advantage of. Like Rodolphe, Léon makes Charles help arrange his wife’s seduction. Tsykynovska, Helen. "Madame Bovary Part 2, Chapter 15." LitCharts. LitCharts LLC, 24 Jul 2014. Web. 18 Apr 2019. Tsykynovska, Helen. "Madame Bovary Part 2, Chapter 15." LitCharts LLC, July 24, 2014. 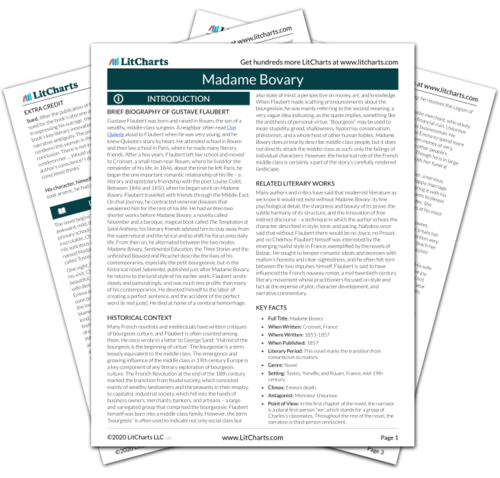 Retrieved April 18, 2019. https://www.litcharts.com/lit/madame-bovary/part-2-chapter-15.